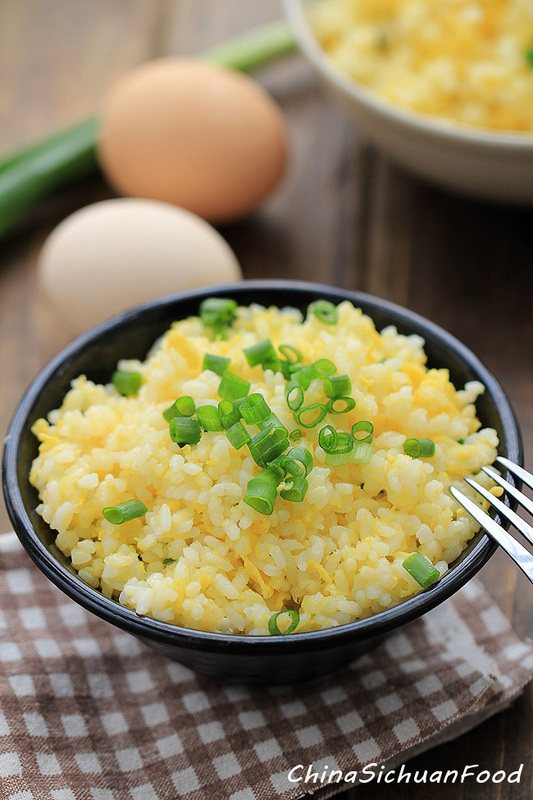 Chinese Egg Fried Rice (蛋炒饭) is a featured Chinese dish popular in all over the country. 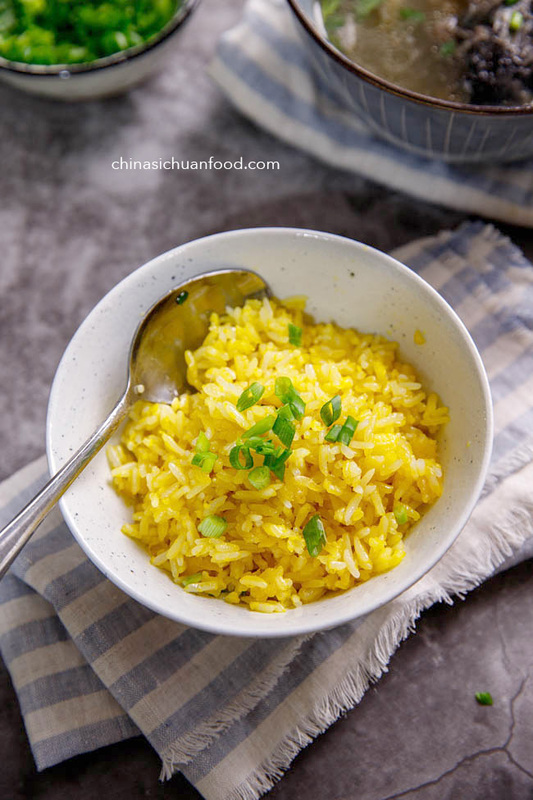 The ingredients are simple but taste is great.Basic fried rice recipes are quite popular all over China. Chinese people stir fry rice with different side ingredients and seasonings. Thus there come different types of fried rice. 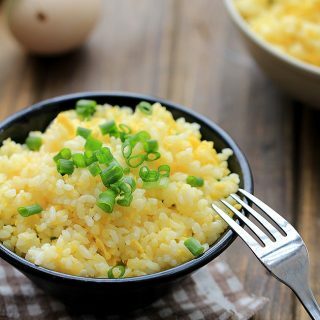 I still remember that various types of fried rice such as fried rice with soy sauce and Yangzhou fried rice are those dishes I love most.Among different types of those recipes, fried rice with beaten egg is the most popular and simplest recipe. 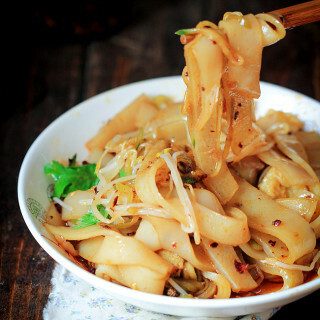 This recipe is quite fitful for those office works and it can be used as the main part of breakfast. Another important side ingredient for basic fried rice is green onions. Green onions are chopped into small pieces and add to the rice at the very last step. Only a small amount is desired. Besides, green onion chops also add a green color to the white and golden color. The secret of making fried rice is that the cooked rice should be with an appropriate humidity—not too dry or too wet. Generally, we cook the rice firstly and then leave it aside for at least 6 hours in normal temperature. Then the most important technique is to break the cold cooked rice into single grains. 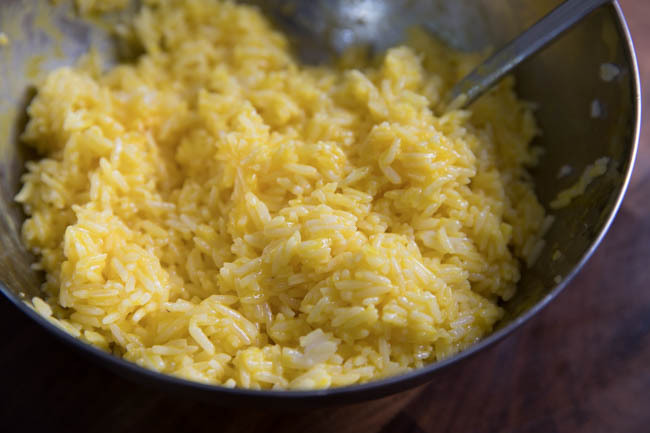 Any chunk among the rice will spoil the taste.As for the numbers of eggs, adjust it according to the amount of rice. 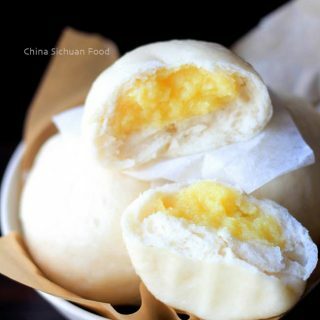 Usually I match one egg with a small bowl of cooked rice(1 small bowl equals around 2 cups).For today’s recipe, I use two bowls of cooked rice and so I use 2 large eggs. 1. Stir-fry the rice to remove extra water contained even the rice is leftover before adding the egg. 2. Do a quick stir-fry just after pouring the egg liquid. So the egg can wrapped on each of the rice grain. Another advanced technique is to mix the egg with the rice previously. This is a extremely help tip for beginners. 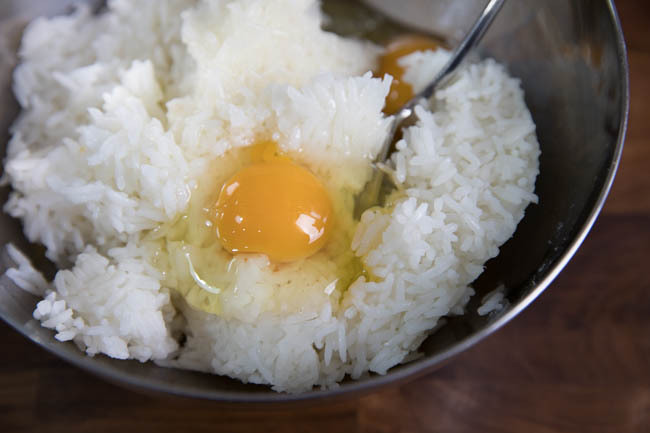 In the mixing process, with the help of egg liquid, the rice can be well separated. Heat oil, place the mixture and fry quickly. Until eggs are well cooked. Perfect Chinese style Egg fried rice. 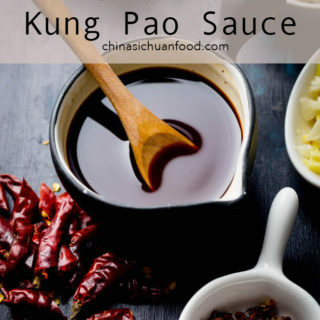 This dish is the basic starting for Chinese egg fried rice dishes. You can add some vegetables if you like. Wash the green onions and finely chop the green part only. Beat the eggs in a bowl. Set aside. Add the rice to wok firstly to fry until they separate with each other(use the slice to break any chunks ). Push the rice to one side of your wok. Heat up 2 tablespoons of cooking oil and pour the egg liquid. 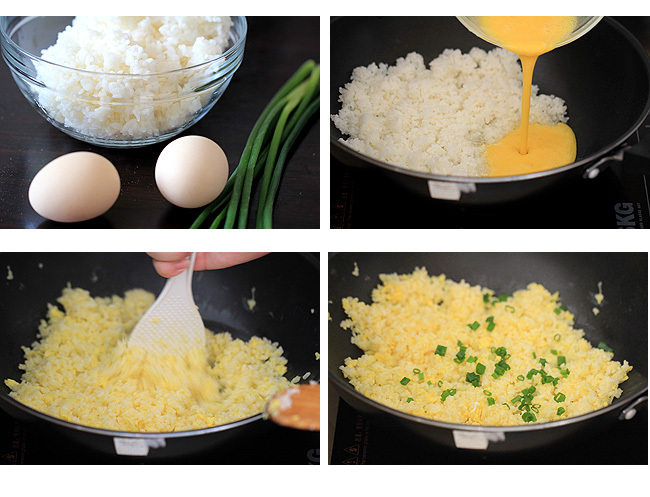 Mix the egg liquid with rice quickly. Add salt and continue cooking until the grains are wrapped by egg. Add half of chopped spring onions to stir-fry until aroma. Transfer to the serving bowls and garnish some chopped spring onions for decoration. Thank you so much for blogging all these amazing recipes! 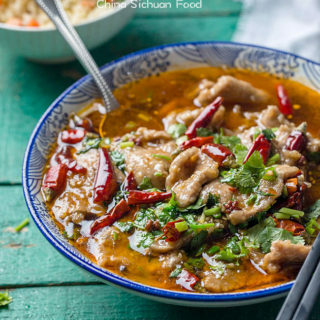 I’m an American who loves Asian food but has no clue how to make it with that authentic taste. I just discovered your blog half an hour ago so I haven’t made anything yet, but I am so excited to try! Thanks for the sweet words. I am so glad to be helpful. Happy cooking! Love looking at the recipes. 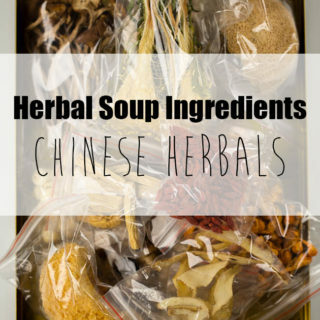 I have an exchange student who is from China and misses her home foods. I was trying to find some i could make her. 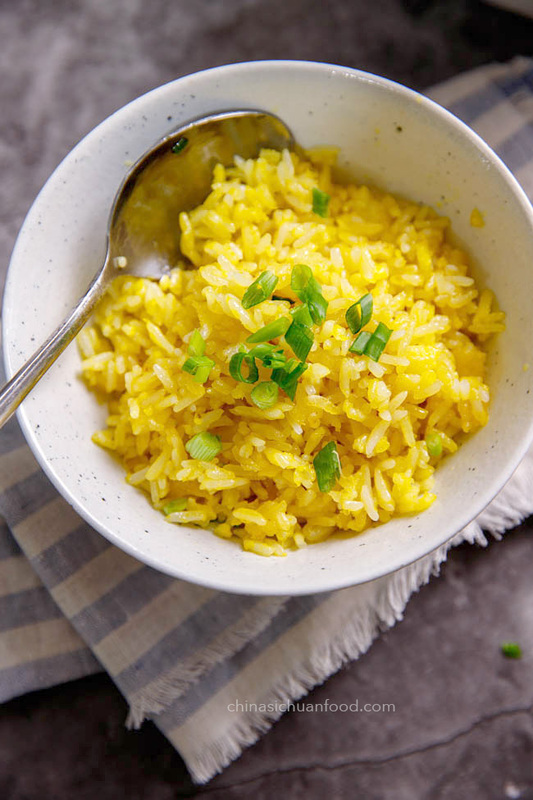 Does the type of rice matter? You are such a kind and caring teacher. Basically almost the type of rice does not matter. But it is better to slightly reduce the water amount when cooking the rice. It is not an good idea to make this for 200 people once. You will need to at least 70 times with a large wok and high fire. So I am sorry that I cannot help. 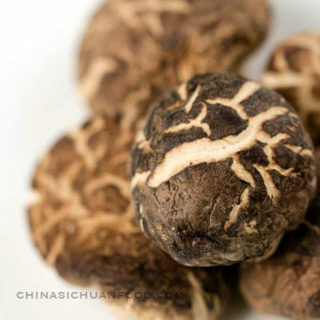 Again, and again, thank you very much for this invaluable help to eat and to cook healthy, lovely and so pleasure. Bless you. Thanks Hernan for such a great comment!! 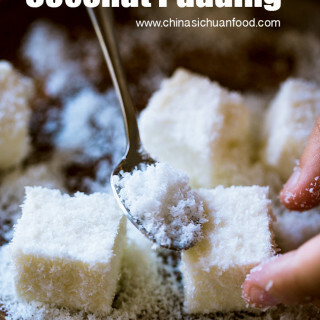 Thank you for this beautiful and simple recipe. 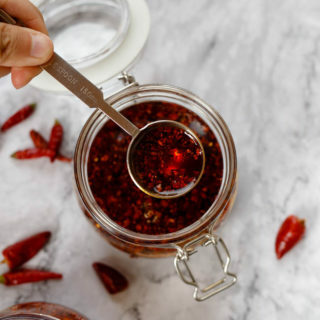 I love reading recipes almost as much as I love to eat, and more than I like to cook, but this looks easy enough for me to try. I will continue to read your recipes and share them, too. Thanks Erica for trusting and leaving me a lovely comment. Happy cooking!